Is Buying A Condo in a Newly Built Building a Good Investment? I recently represented a couple who bought a two bedroom condo in the newly built 1450 Franklin. They had been looking for quite a long time, not happy with the options that had come on the market. In fact, they were so frustrated that they stopped looking for a year and then earlier this year started looking again. What they saw in the Franklin Street building was an opportunity to have their daughter live in a brand new condo with high-end finishes which was in a perfect location for her to have an easy commute to her downtown law firm. They are thrilled with their purchase but wondered with all of the new construction units coming on the market if their purchase would be a good investment. I have two clients who bought in brand new buildings in the past six to seven years, one in 2010 and one in 2011. 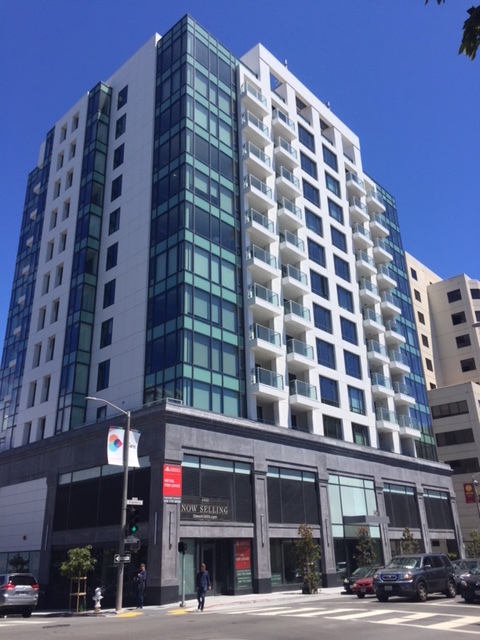 My client, Joe, bought a one bedroom at the Artani at 818 Van Ness in 2010 and after we negotiated a bit, he paid $494,000. The most recent sale of a one bedroom unit in that building sold for $790,000 in August of 2016, a year ago. My other client, Dan, bought a one bedroom unit at 555 Bartlett in 2011 for $435,000, an excellent deal if I say so myself. Since it was one of the last condos in the building, they were open to taking quite a discount. The most recent sale of a one bedroom unit was for $855,000 in May of this year. I think you would agree that both of these buyers made a good investment. While nothing is assured, if you buy and hold in a good building, you are likely to earn a good return on your investment, not to mention, enjoy a nice home of your own. This past week at our sales meeting, a representative of The Mark Company (a marketing firm acquired by Pacific Union International) discussed the trends in the new construction market. New construction available inventory of 895 units is down 23% from July of 2016. Last month’s new construction sales more than doubled the number sold during last July. What is interesting is that people have been talking about how new construction developments have brought so many excess units on the market that it has slowed sales in areas like SOMA. While this may be so, things are changing. Last year, a number of big projects like the Lumina and the Harrison came on the market at the same time creating a surplus of inventory. However, since many of these new units have been sold, inventory is declining and it is anticipated that new construction inventory will not greatly increase again until 2019 or 2020. At the same time, resale inventory remains low. All of this anticipates a strong market for the fall and possibly good appreciation for those who were smart enough to buy in the past year. If you are interested in touring any of the new construction buildings left, please don’t hesitate to give me a call. Previous: Home Prices Rise Substantially in St. Francis Wood! Next: Is Great Customer Service Important to You?